Choreographing and mixing a flash mob medley based around flowers was never going to be easy, but actually, thanks to the amazing Lucie Kerley and Grow Wild team at Kew Gardens providing me a list of tracks to choose from (they really did their research!) I had a wonderful time mixing together the final track, which included (get ready for some serious gardening puns): FLOWERS by Sweet Female Attitude (an absolute 90s anthem), WILD Ones by Flo Rida, Walking on SUNSHINE, and Shake, Rattle and Roll…..’what does that have to do with flowers?’ I hear you ask…well, when you change the lyrics to Shake, Rattle and SOW of course! We had such a laugh on this one! Throwing in some seriously cool bits of face paint and costume design, this was a welcome change from doing a performance in a waiter’s outfit! The kind and lovely team from Kew Gardens gave us such creative license, and the wonderful Jen at Jen’s Creations brought our makeup ideas to life in a wonderful way. Enjoy the video summary of the event here. When three girls get to spend half a week in the stunning St Tropez to perform for a gorgeous lady’s 40th Birthday, it feels like a fairytale come true. The wonderful client Alison Boothman and her family made us feel so welcome (we stayed in a separate apartment in their home) and we spent the time that we weren’t performing sunning ourselves by the pool! When the party rolled around, we surprised the guests by interrupting Alison’s big speech with a SPECTACULAR red wine spillage all over one of the ‘waitresses’….we then all revealed our hidden, Beyonce leotards! We ended our second performance by jumping straight into the pool…despite being underwater for the rapturous applause, we were assured when dried off that it was a brilliant way to end it. An unforgettable job. To be put in charge of a £13,000 budget to make a 30 second video wasn’t something we were entirely expecting in our first year, but we rose to the challenge and in conjunction with PITCH Media, we booked Battersea Park and successfully filmed our first ever non-dance flash mob. With a cast of 60+ extras, we sprung out and cheered random runners on, and though months in the making, the day of filming was a lot of fun with some fantastic people - and all for a good cause. See the final Wings for Life promo here. In conjunction with Top Secret Agent, our new partners in crime, this idea sounded bizarre at first - a lady wanting to announce she was pregnant to her husband! But it turned out to be the most touching, heartwarming flash mob we’ve ever done, and the client Sandra learnt the end of our flash mob dance so brilliantly - and then, with true style, whipped out her pregnancy test! If you only watch one of the videos in this list, make it this one. But have the tissues ready! 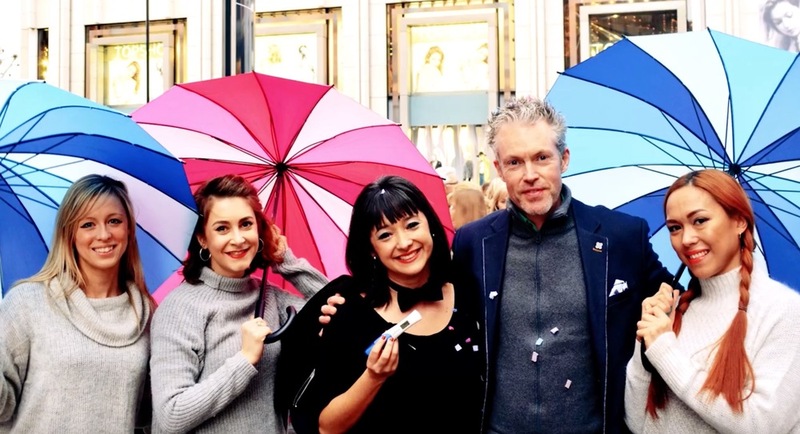 Our first ever proposal flash mob was our absolute top favourite of the year. The lovely Rushil was an absolute darling to work with, and commissioned the brilliant ‘Marry You’ by Bruno Mars for his special moment. Kiran, his girlfriend, didn’t suspect that it was for her at all, until the minute he got down on one knee at the end! You can hear the crowd’s realising what’s going on, and their claps and cheers move from us to Rushil, and Kiran’s reaction is absolutely fantastic. Bring on all the proposals, as our 100% yes record continues into 2016…..watch the proposal video here. So those are our faves from 2015! Stay tuned for our next entry, a case study of the perfect proposal flash mob!